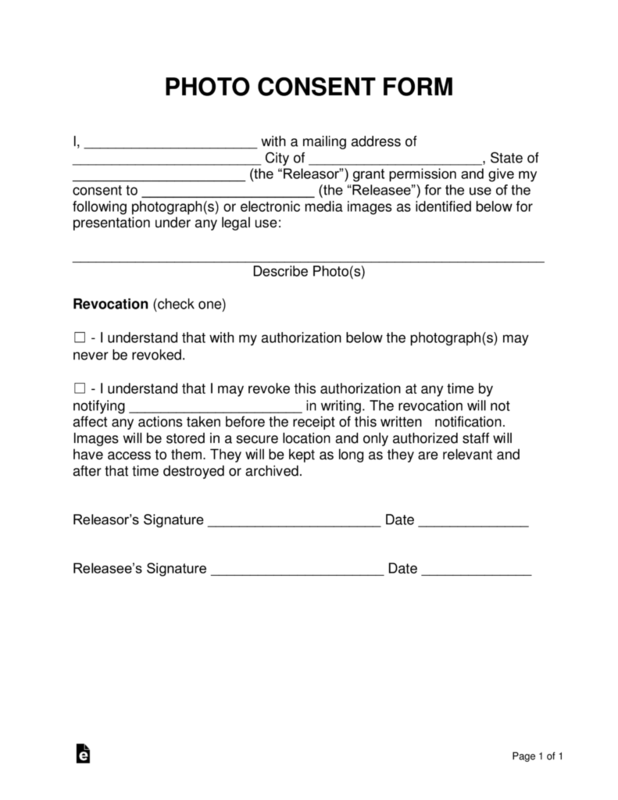 The photo consent form is filled out by an individual consenting the release of images captured of them, or images under their ownership, to someone else. Typically, the person(s) asking for consent wishes to use the individual’s photos/images for media publication (social media, television, YouTube, etc.). The form, aside from granting permission to the requesting party, will include a description of the photo(s) being requested. A revocation clause is included to allow the individual providing consent to annul the authorization of use at any point in time. 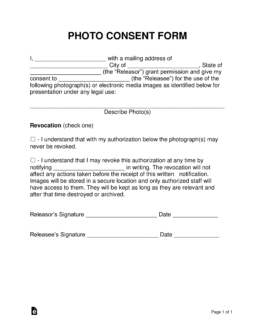 Both the Releasor (individual authorizing consent) and the Releasee (person requesting authorization) will sign the photo consent form. Step 1 – Download in Adobe PDF, Microsoft Word (.docx), or Open Document Text (.odt). Step 2 – The Releasor should include their name, address, city, state, and the name of the Releasee in the first paragraph of the form. Below that, a brief description of all the photos should be provided. Step 3 – The Releasor must select one of the boxes under the “Revocation” section to indicate whether or not they will have the ability to revoke the authorization after the consent form has been signed. If the second checkbox was selected, include the name of the Releasee in the empty field. Step 4 – Signatures from both parties must be included at the bottom of the form along with the current date.